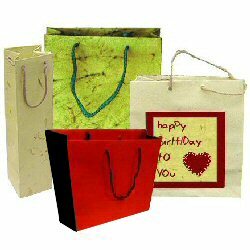 Give new life to old gift bags and recycle clean brown paper bags by decorating them with unique papers. Recycle, save money and add a personal touch to your gift wrapping. 1. Carefully open the brown paper bag and un-glue the bottom flaps. Don’t worry about a little tearing. 2. Place the opened bag on the paper and draw the outlines keeping the length slightly longer than the original bag. 3. Cut the paper to cover the bag all the way around, with some extra paper to fold over the top. 4. Apply a layer of glue to original bag – specially at the folds. 5. Nicely place the cut handmade paper on it and align the bottom edge with the bottom of the bag. Attach to one side of the bag, making sure that the paper sticks on smoothly. 6. Cut a slit at each corner of extra paper fold at the top of the bag for an easier fold. 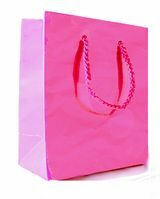 Fold the excess paper down into the paper bag, making sure it is smooth. 7. Glue the bottom flaps. Tip: If you have a card (thicker) paper, you don’t need to use the underlying bag. (You can still use a brown bag to trace the folds. When the bag is ready, use a drawstring or ribbons to make the handles.